Ant or Maven project is opened in Visual Studio. You can find instructions how to create a Maven project in this section. Instructions for Ant projects are in this section. This section describes various language-specific features of the Java code editor, their usage and configuration. Not all of the features are covered here, some have their separate sections in the manual. IntegraStudio provides syntax coloring for Java language. It works similar to other languages in Visual Studio. You can change the colors as usual, by choosing Tools / Options / Fonts and colors option. Currently the colorizer supports following special categories: Keyword, Comment, Identifier, String, Number, Operator. This list is likely to expand in future releases of IntegraStudio. IntegraStudio supports programming error detection in Java code "on the fly". 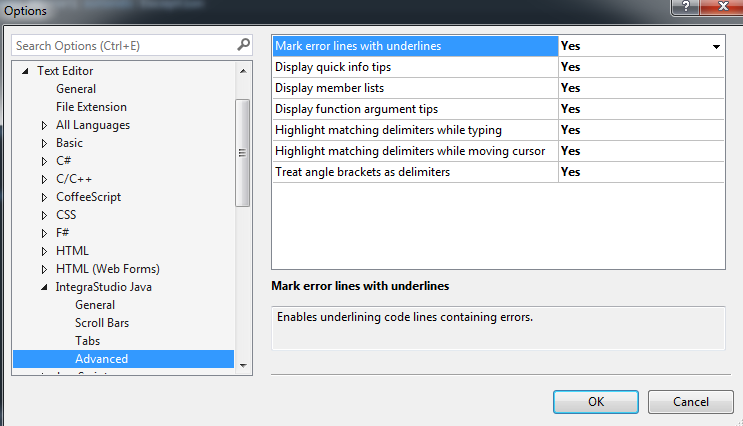 Errors are detected as you type the code, just same as for other languages supported by Visual Studio. Lines of code containing errors are underlined. Detected errors are also visible in the Task list window. You can turn them on or off by right-clicking on the task list and toggling Show CodeSense errors option (IntegraStudio uses the term CodeSense instead of IntelliSense because the latter one is a trademark of Microsoft). Note that immediate error detection (usually called IntelliSense in Visual Studio terminology) is not the same as running the compiler. IntegraStudio does not run actual Java compiler at this stage (like Eclipse do) in order to make IDE fast and responsive. Thus, not all errors are detected, but the most typical (and easy to detect) ones are. The heuristic Java code analysis which IntegraStudio employs goes fairly deep and can detect not only simple syntax errors, but also many involved errors related to overloading, generics and exceptions usage. Beta version notice: in case of IntegraStudio beta (which may contain bugs), should you ever see a false alarm (correct code is marked as an error), please report it to support@softerg.com. Please attach some snippet of code exposing the error. We consider such issues high priority. If you hover the mouse over a name of variable, function or a class, IntegraStudio will display short information about that entity. When you type a method call, IntegraStudio will display an information on method arguments. Method overloading and generics are supported. When you type a member access operator (dot), IntegraStudo will display a list of available members of a class or namespace. When you type a code fragment with parentheses, brackets or curly braces, IntegraStudio can display the matching token. Position the cursor after the opening or closing token to trigger the highlight. In order to comment or uncomment whole region of code, select the region and choose Edit / Advanced / Comment selection or Uncomment selection. option. Visual Studio will insert or remove comment marks around the code and IntegraStudio ensures that these are valid Java comments. You can start or update outlining by right-clicking on the editor and choosing Outlining / Collapse to definitions option. The outline structure will be calculated, and buttons will appear. By default, classes (also interfaces and enums) are expanded, while methods are collapsed (their interior is hidden). Click the +/- buttons to expand or collapse idividual nodes. You can remove outlining by choosing Stop outlining from the same menu. In case of Visual Studio 2010 and newer, you will need to additionally click on some +/- button for this change to take effect. The buttons will disappear then, and your code will be presented "as is". You can also selectively remove outlining buttons (and permanently expand a node) by positioning the cursor on the visible part and using Stop hiding current option. The Hide selection option allows to add an outlining button and hide arbitrary text fragment under it. Just select the fragment in the editor and use this option. The Toggle outline expansion option is an equivalent of clicking the +/- button. Visual Studio allows to move the editing caret by entire word, by pressing Control key along with a left/right arrow key. What is exact meaning of the "word" term, it depends on the language. IntegraStudio supports this feature and a Java token ia considered a word (identifier, keyword, etc.). A window with search results should appear. Double click on a row to open the code where the reference is located. By default, all features are enabled.